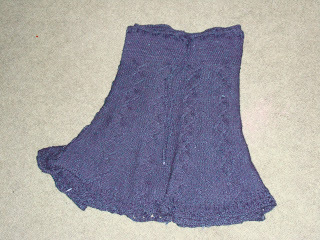 Since making Mason's sweater, I have had an idea in mind for a skirt I would like to make out of Rowan's Denim yarn. I had a hard time finding a pattern that met what I had in mind - so I ended up designing one to meet what I wanted - a trumpet/circle type shape, with an interesting pattern, and a little bit of lace at the bottom. 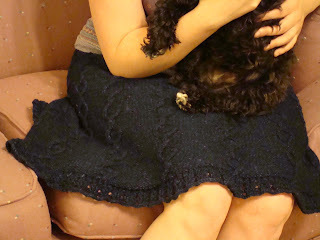 I used the cable pattern "bubbles" from Vogue Stichionary II for the main body of the skirt. I kind of ended up improvising the lace - mostly because I couldn't find a pattern that fitted exactly what I wanted. okay, that is seriously beyond adorable! This was quite a project to design yourself and have it fit you so prettily! Your new skirt is just lovely with the dainty lace flounce at the edge and the pretty design. I am just so impressed with your skills! WOWZERS - that is adorable and looks seriously hard. 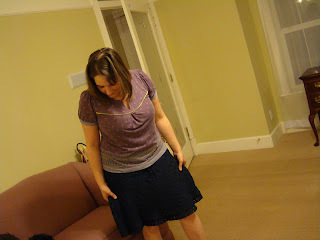 I'm struggling with ONE sock - I'm thinking I've got a ways to go before tackling something as cute as this skirt. wow, i can't believe that's home/handmade. great work! your knitting is so awesome! you always make such nice things!